TUM Asia aims to groom future leaders in selected areas of technology. Specifically, the 2-year full-time Master of Science in Industrial Chemistry will be an enabling postgraduate course for specialist engineers for the pharmaceutical, as well as the fine and specialty chemical industries. The degree will be jointly awarded by Technische Universität München (TUM) and the National University of Singapore (NUS). 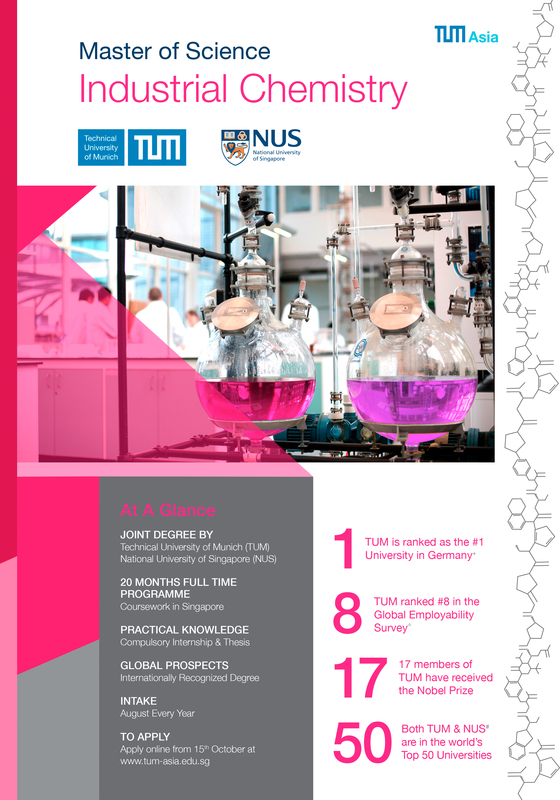 According to several independent rankings, the Faculty of Chemistry of TUM represents one of the leading in Germany in terms of both research and education with more than 50 professors and their research groups covering diverse fields in modern chemistry. Through this, it provides great opportunities for interdisciplinary research programme and collaborations. Four Nobel Prize winners amongst the faculty members of Chemistry attest to a premium research level. One of these Nobel Laureates, Professor Robert Huber, was a member of the teaching staff of TUM Asia during the early years of the programme. In order to be eligible for the programme, you must have at least a Bachelor Degree** (completed in at least three years, depending on factors such as the rest of your education background) in Chemical Engineering or Chemistry or in a closely related discipline with remarkable results. The teaching faculty in the programme are predominately from TUM and NUS, as well as additional modules taught by industry leaders and other expert academics. All coursework is conducted in English and students will be taught by Professors from TUM, NUS, or other highly ranked universities in Germany or Asia. Student-teacher ratio averages between 15:1 to 30:1. Only live teaching is conducted in all TUM Asia classes. All examinations will be written by the student him/herself, and examination results are released approximately 1-3 months after the examination. The Master of Science in Industrial Chemistry degree is a 2-year full-time programme. Students must complete their coursework, 3-month internship and 6-month of Master Thesis writing to qualify for graduation. In order for a student to graduate on time, he/she must obtain a minimum overall CAP score of 2.50 or (C+). An academic warning will be issued to students if their CAP score falls below 2.50. There is also a risk of candidature termination for failure in any modules if overall CAP score falls below 2.50. A student will successfully complete his/her degree course after acquiring 120 modular credits, and assuming the circumstances that the student will not have any failed modules that he/she is required to retake. For example, if a student is enrolled in August 2017, he/she is likely to complete the course by August 2019, subject to the fulfilment of the graduation criteria. The module aims to teach students the technical writing techniques and to familiarise them with the different business communication styles. Students will learn the international usage of the English language in technical communication especially in academic writing, as well as learn how to make effective presentations and prepare technical or scientific papers. During the course work in semester 1&2, students will have to complete 4 core modules. Each module has 45 contact hours and comes with a practical. They will take place at facilities at NUS or TUM Asia by TUM or NUS professors. The module organometallic chemistry and molecular catalysis explain organometallic compounds, their synthesis and reaction behaviour. The applications of organometallic, inorganic and bioinorganic catalysts in industry and research are described, basic reaction mechanisms and the constituting elementary reactions are introduced and possibilities for the immobilization of homogeneous catalysts are described. An overview of the development of organometallic chemistry and catalysis and its implication on industrial chemistry throughout the existence of chemical industries are given. This course provides a foundation for the understanding of the varying chemistries of the elements of the Periodic Table and periodic trends in physical and chemical properties, with emphasis on inorganic materials. The course includes the descriptive chemistry of many of the most common elements and their inorganic compounds, integrating such topics as symmetry and structure with the emphasis on solid-state structures of metals, salts, and extended covalent systems, bonding models, reactions and the synthesis and characterization of inorganic compounds including basics of crystallography. The lecture covers the thermodynamics and kinetics of chemical reactions, mass/heat balances, performance equations and residence time distributions in ideal and real reactors as well as the link to micro- and macro-kinetics (mass transfer on phase boundaries, pore diffusion, adsorption) and catalysis (kinetic models and principle reaction mechanisms). The lecture covers classification of synthetic macromolecules by properties, structure and reaction type (free radical, ionic and coordinative polymerization as well as polycondensation); ideal and real kinetics of polymer formation; molecular mass determination and molecular mass distributions; process technology of polyreactions and processing of plastics; reactor technology, discontinuous and continuous process control; influence of process parameters on molecular mass distribution. The goal of this module is to provide insight into the important ﬁeld of catalysis. Both homogeneous and heterogeneous catalysis will be described, and important applications will be exemplary described. An understanding of the principles of catalysis and the demands on efﬁcient catalysts will be provided. The principles of establishing catalytic mechanisms will be outlined. The scope of the course module is to enable students to understand the principal processes involved in petroleum processing, in the interface between petroleum reﬁning and a petrochemical plant and in major petrochemical operations. This includes: Basics of crude oil chemistry, Distillation of crude oil, Catalytic conversion and upgrading processes, Thermal conversion and upgrading processes, Production and managing hydrogen, Basic Petrochemical Processes. The scope of the course module is to enable students to understand the principals and the applications of unit operations involved in Petroleum and Petrochemical Processes. This is aimed at providing the skills in the following ﬁelds: Thermal unit operations, Mechanical unit operations, Reactor Technology. The course teaches the qualitative and quantitative basics engineering principles used to design and to operate mechanical, thermal, and chemical units of a process plant. The goal of the module is to provide insights in the field of construction chemistry. The lecture will cover the following topics: chemistry of inorganic and organic binders, details on materials such as Portland, aluminate cement, CaSO4 binders, silicons, epoxy resins, polyurethanes and latex dispersions. In addition, the lecture will give an overview of the physical properties and nanostructure of building materials, surface properties, corrosion processes, sol-gel process, solid state chemistry, geopolymers, and interactions on polymer – cement surface. The lecture covers the chemistry and engineering of the materials together with details on the structure and properties of the materials such as cement, concrete, steel, etc. The following topics will also be covered in the lectures: physical, chemical and mechanical properties of typical construction materials, the relationship between properties and structures, multi-scale materials and structures, characterization methods for materials at diverse scale, application of materials in building engineering. The lecture covers the following topics: characterization of polymer admixtures for cement mortar and concrete. Various synthesis methods of different types of concrete admixtures, such as superplasticizers, accelerators, VMAs. Furthermore, the following subjects will be presented: analytical techniques and processing methods, waterproofing materials, heating insulating polymer foam, fibre reinforced polymer (FRP). Polymer latexes and re-dispersible powders used in construction applications and major properties of polymer dispersions and the characterization methods. The primary purpose of the module is to introduce students to the different areas of business administration with the final objective to give them a basic understanding of how to face decision problems in a company. Most importantly, we will analyse long-term investment decisions, how to set-up strategic planning in a company, how to gather timely information about the current situation of a company, and how to set-up the long-term financial structure. As the module is taught together with industry representatives, a clear practical orientation is guaranteed. A brief description of the history of law, legal theories and importance for the commercial life. Development of the legal systems “common law” and “civil law”. Understanding of the common routes of both systems. Fundamental principles and differences between two legal systems, contract law and tort law. Basic principles of the UN Conventions for sales of goods, latest developments within the EU – legislation in respect of environmental and IT regulations. The lecture will cover the following topics: Innovation vs. invention, Creating value through innovation, Four forces of innovation, Value to the customer and Hi-Tech Marketing, Business system innovation and Service innovations, Technological discontinuities, S-Curves and Scenario techniques, Managing uncertainty and agility of enterprises, Innovation, productivity and restructuring, Venture capital, Start-ups and financing of innovation, Innovation-driven economic cycles and Innovation impact on growth and jobs. Marketing strategies are developed for a typical chemical commodity and speciality business. Students will work out, in teams, business cases, make their own business decisions and develop marketing concepts based on provided information of a real case study. This module will give a brief introduction to intellectual property rights, and focus on insights into general principles of patent law and international conventions governing the patent law. Current developments and criticism of the current patent law system will also be addressed. In addition, practical (legal) aspects of the commercialization of patents will be dealt with. *Disclaimer: Specialization and Elective modules available for selection are subject to availability. Unforeseen circumstances that affect the availability of the module include an insufficient number of students taking up the module and/or the unavailability of the professor. TUM Asia reserves the right to cancel or postpone the module under such circumstances. The total tuition fees for this Master programme, if expressed in Singapore Dollar equivalent, are S$ 48,150.00* (inclusive of 7% GST).